Yes, you can train like an athlete and still hit your arms the way you know you want to. Even if you train full body the rest of the week, save one day a week to blow up your bis and tris with this routine! If you know me, you know I love to do crazy stuff in and out of the gym. But my training doesn't end there; I also do a lot of traditional lifting. And that's why I built the Strong and Shredded Arm Workout: so you can get the show-stopping biceps and triceps you want while maintaining a well-rounded, athletic program. I recommend plugging this workout into your full routine once a week, wherever it works best in your program. Want a more complete suggestion? If you perform my Ultimate Full-Body Workout a couple of times a week, my Abs Without Crunches Full-Body Core Routine once, the 400-Rep Juggernaut Circuit once, and this routine once, you've got a killer recipe to look—and move—like a beast in no time. Give it a shot for four weeks, and let me know how it goes. Or just plug this routine into your own program for the next few weeks, and get on the fast track to furious growth. However you do this workout, just do it—because I'm sure you'll love it. You're going to run through 10 exercises, but don't worry; there'll be minimal breaks between them, so you'll get through it quickly. Now let's get growing. Designed To Support Extended Muscle Protein Synthesis. Go Now! 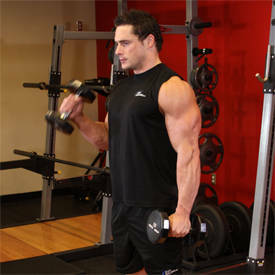 Alternating dumbbell curl: These are really a warm-up more than anything, so use a weight that allows you to hit all the reps. Move some blood into the working muscle and warm up your joints, then go for broke on the last set. 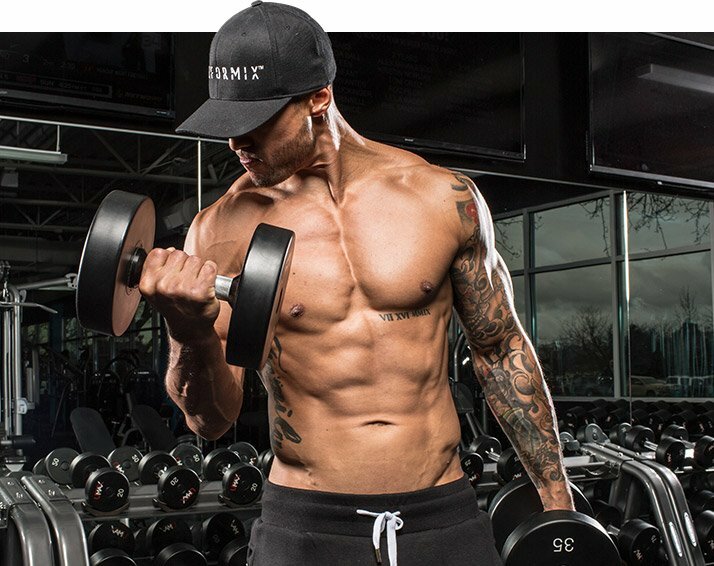 Single-arm hammer curl: Go a little bit heavier here than you did for the alternating curls, and brace yourself with your free hand on your opposite leg if necessary. That cross-body action allows you to generate some serious tension. You can increase the weight each set here if it feels right, but you don't have to. Single-arm plank dumbbell curl: You've probably never done these before! Trust me, your core and shoulders will be burning like crazy by the end of four sets. I like to look right at my working biceps while I do these, to get that mind-muscle connection firing. Also, keep your working elbow attached to your hip, and keep the palm holding the dumbbell pointed forward rather than inward, so you can hit that biceps peak. Overhead cable curl: Your biceps should be pretty cooked by now, so just use a weight that allows you to hit all the reps and finish off with a great pump. Weighted dip: Hold the weight however you want here. Got a dip belt? Great. But as you can see in the video, I just stick a dumbbell between my thighs, cross my ankles, and go to town. Whatever works for you. 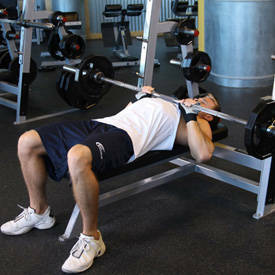 Close-grip bench press: I like to put my hands on the smooth part of the bar, just inside the knurling. 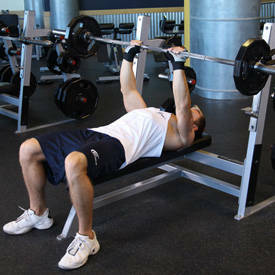 Add weight if possible as the reps go down, but don't go crazy. You still have a lot of work to do, so sticking with the same weight across all four sets is OK.
Bench-dip superset: If you saw my Abs Without Crunches video, you know I like mixing bodyweight movements with weighted versions of the same movement. This can make it hard to be precise with rep ranges, but do your best. A 45-pound plate should be all you need for this superset. Triceps push-down: Just like the overhead curls, this is all about wringing every last little bit out of the triceps and finishing with a pump. 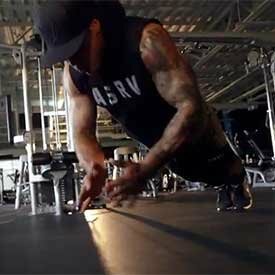 Nobody cares how much weight you're pushing down, so just focus on hitting the reps.
Clapping push-ups: The first time you do these after this workout, you might fall on your face on the first rep. But keep coming back! Not only are these one of my absolute favorite movements, they're also a great way to test how much bodyweight strength you're building. If you can bust out this workout and then still knock out a solid set of 5-10 clapping push-ups, consider yourself legit.